We were very happy to hear from one of our sponsors Ben Harrinson this week who is competing in the NG Road Racing 215 Formula 400. Ben put together a fantastic report for you all to enjoy below. 2015 started off very very cold! I had booked onto the test day the Friday before as i hadn’t ridden the bike since the last race of 2014, I thought it would be a good idea to get used to the bike again and try and get some set up for the coming races. The test day went well; I immediately felt at home on the bike and set about getting my lines sorted. I had an ongoing issue with the bike running quite bad below 8k revs but worked around it. At the end of the test day i felt good on the bike and was ready for racing! The weather was dry but it was extremely cold, tyre temp was going to be a big issue throughout the whole day so i took it easy in morning practice and felt out the grip levels and track conditions. I started 2nd on the grid for the qualifier race, I managed to get a good start and settle into 2nd place where i stayed which put me 2nd on the grid for the final. I managed to hook the bike up well off the line starting the final but due to the cold conditions i took it too carefully into the first corner and got passed buy Emma Jarman on her ZXR. I set after her as i knew it I could pass I’d have some clear track to try and pull a gap. 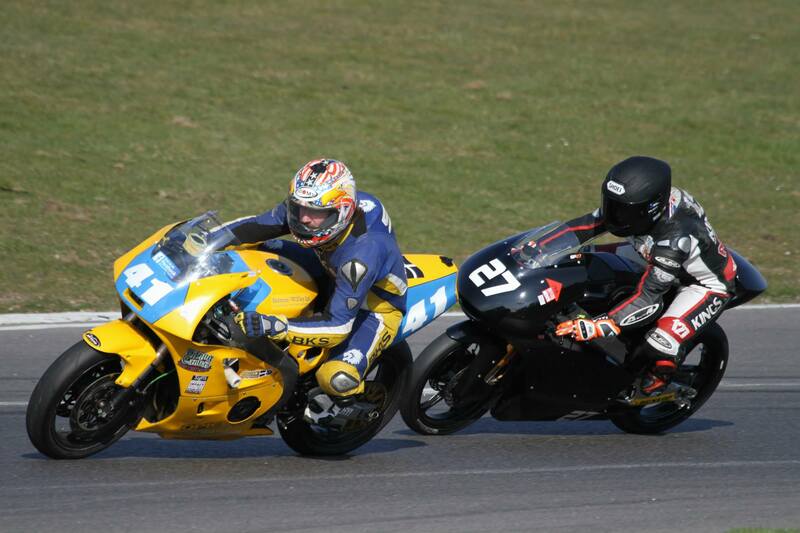 Unfortunately i made a mistake which let Tim Bradley through on his FZR. I got a bit carried away trying to make up for lost ground and ended up overtaking under a yellow flag which i hadn’t seen so i finished the race in 2nd place, but got a time penalty which put me back into 3rd. I was still happy to get a podium in the first race of the season and i knew I had the pace to run at the front. The weather decided to have a bit of fun with us and absolutely tip it down over night, so now it was freezing cold and wet, grip was going to be a serious issue, it turned into who could stay on the bike rather than who wins the race. To make matters worse it was the first full wet race since my big crash at Cadwell Park in May 2014. I took the practice session very gently as there were already people crashing in the wet conditions. I started the qualifier 2nd on the grid again and focused on just finishing the race and gaining confidence for the final. I was running in 5th place with Simon and David in front of me, i used them as a target to aim for and slowly started to reel them in, getting faster each lap. I passed Simon for 4th place on the last lap giving me a second row start for the final. I changed some settings on the suspension for the final and it worked really well, the bike felt really comfortable and i managed to push more than in the qualifier, I was running 2nd for the whole race, at one point i started to close in on Tim Bradley in 1st but caught a back marker at the wrong time so ended up finishing in 2nd place with the fastest lap of the race too. It was a great start to the season and it’s only going to get better from here, i feel confident in the wet again and comfortable on the bike too. So after round 1 & 2 I’m running 2nd in the championship and ready to fight for the 2015 title! What a great start from Ben, Opie Oils wishes the same in the next round and wishes him the best of luck for 2015 season. Good news, Opie Oils have extended the range of performance air filters available with the addition of Pipercross. Pipercross Induction Systems remove the restrictive factory airbox to offer the maximum possible airflow into the engine. All filters use Pipercross composite airflow technology and systems are only released for production when they are bench-flow tested and make an improvement in airflow performance. We also stock the Pipercross Viper Induction Kits which are the top level induction kit from Pipercross. Viper Induction Kits replace the original restrictive paper air filter and airbox with a high performance, carbon fibre sealed airbox. The carbon heat shield is bonded directly to a 150mm polished alloy rampipe to greatly increase laminar air flow within the filter, and maximise power. Over 70 universal Pipercross filters available at Opie Oils, prices start at just £17.21 before members 10% discount! The all-new Pipercross Venom Air Intake incorporates a new double-conical air filter design to increase surface area by over 40% when compared to a standard shaped cone. The double-conical filter gives the New Pipercross Venom the largest surface area of any aftermarket enclosed intake system of this type available today. Increased maximum air flow and low restriction for any given volume of air flow and increased dust capacity means less servicing is required. Pipercross cold air feed kits supply cold air from the front grill/bumper straight to your induction kit. Giving maximum power and enhancing the look of your engine bay. – Pipercross Crank Case Breather Filters – Prices start from £20.39 before members discount. Crank case breather filters are designed to prevent contaminated oil vapour from entering back into the engine. To be attached directly onto your existing crank case breather hose, the foam filter inside the case is resistant to chemical erosion. Designed for road and competition single carbs, the PX300 consists of a lightweight ring plate bonded to a high performance air filter element. The element is made from reticulated foam in a triple layer laminate, with the filter being supported internally by a metal cage. The PX300 is designed for use on a large range of carburettors as the baseplates are ordered separately to ensure the best combinations for your engine. When ordering elements, Pipercross advise to fit the largest possible, allowing a 19mm gap between the trumpet mouth or carb face and the inner face of the filter. The ultimate filter for Formula Ford and Superstocks. Available as a lightweight throw away filter, designed to be changed at every engine build. Can also be fitted on any car using a Weber carburettor DGAV, DGV, DGAR, etc. The PX500 range of filters is developed for twin carburettors but in a compact design for applications where space can cause an issue e.g. Motorcycles, MG Midget, Metro, Mini etc. The range consists of a filter unit which utilises the Pipercross competition foam, bonded to a ring plate. This ring plate can be attached (using the supplied DZUS fasteners) to either a tailored base plate or a blank base plate so you can cut the holes to suit your application. Remember to leave at least 20mm between the end of the trumpet/carburettor inlet and the inside of the filter. Pipercross accessories available at Opie Oils include filter servicing kits and Alloy Ram Piper trumpets. Together with Pipercross and K&N, Opie Oils now offer an extensive range of performance air filters. If you have any questions regarding Pipercross or other any product we stock then give us a call on 01209 202949 or drop us an email to sales@opieoils.co.uk and we will be happy to help.